Bikers or those who do not like to drive in Germany: should take a train from Hamburg’s central station to St. Peter-Ording. There are several trains a day leaving from central station. 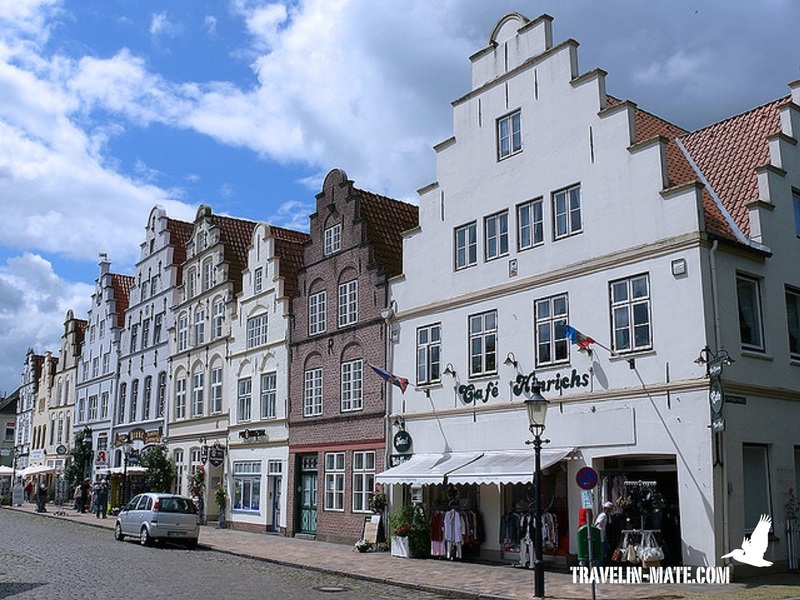 Every connection requires a train change in the coastal town of Husum. The ride is approx. 3 hours. If you exit at the station St. Peter-Ording Dorf, the town’s central station, you arrive in the village of St. Peter. If you want to get to the beautiful sea bridge and popular beach section you should exit at St. Peter Bad, which is about 2.5 miles North of the village. ​By car: you take the highway A7 North from Hamburg towards Flensburg and change onto highway A23 towards Husum/Heide. Follow the highway up to Toenning and change here onto the country road B202/Gardinger Chaussee (right exit). Continue for another 18.4 km (~ 11 miles) and make a left into Neuweg/K36 to St. Peter-Ording. For the village follow the road to its end. For the beach resort and sea bridge make a right onto Eiderstedter Straße and later a left into Im Bad. Im Bad is the main artery that runs through the beach resort. 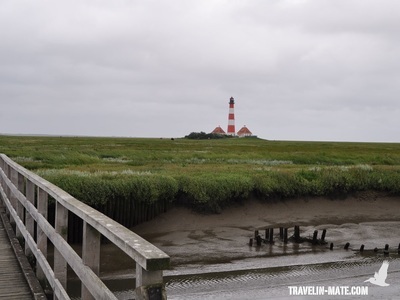 St. Peter is a popular German beach and spa resort at the North Sea with a 7.5 miles (12 km) long and partially up to over 1 mile (2 km) wide beach, shifting sand dunes, and wide salt meadows. 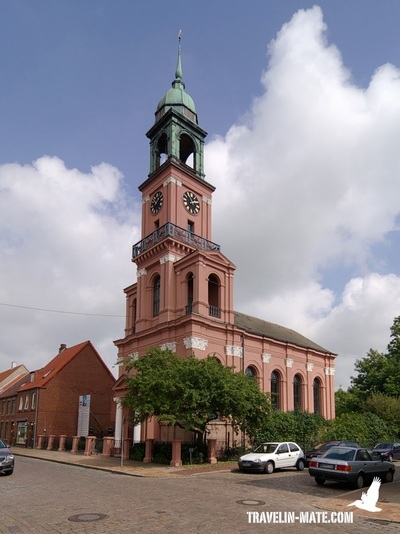 The town consists of different districts that stretch from the South to the North (Böhl, Dorf, Bad, Ording). In the past these were separate villages before they were united to one community. The town is framed on the seaside by the long beach, which is partially flooded during high tide and on the other side by a forest and grassland. The initiation for a seaside resort dates back to 1877 with the construction of a hotel. 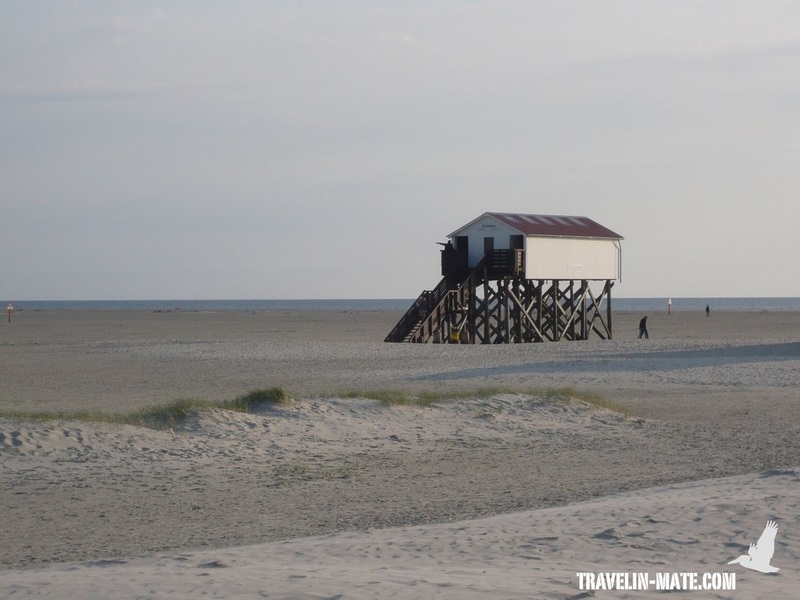 By today St. Peter-Ording is one of the largest beach resorts in Germany. Dorf is the most picturesque area of St. Peter since it contains many historic thatched houses and the 800-year-old church. In contrary Bad is more contemporary and the center of the resort with most hotels, B&Bs, shops, and vacation rentals. One of the scenic landmarks in Bad is the wooden sea bridge that goes off the beach promenade and runs over ½ a mile (1 km) through dunes and salt meadows to the ocean. From the bridge you have marvelous views towards the stilt houses and the wide beach with the roofed wicker beach chairs. These chairs have space for 2 people and are typical for the German shore. They protect you against wind, sun, and even rain since they have a foldable roof and wooden walls on the side. You can rent them daily, weekly or for a whole month. 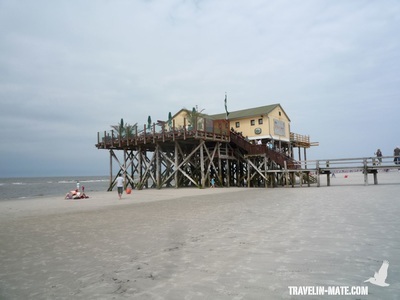 The stilt houses that line St. Peter’s shore are over 100 years old and the town’s most famous landmarks. 15 houses are scattered along the beach with most of them located at the beach section between Bad and Ording. When St. Peter developed into a beach resort they replaced beach shacks that were consistently destroyed by the high tides. 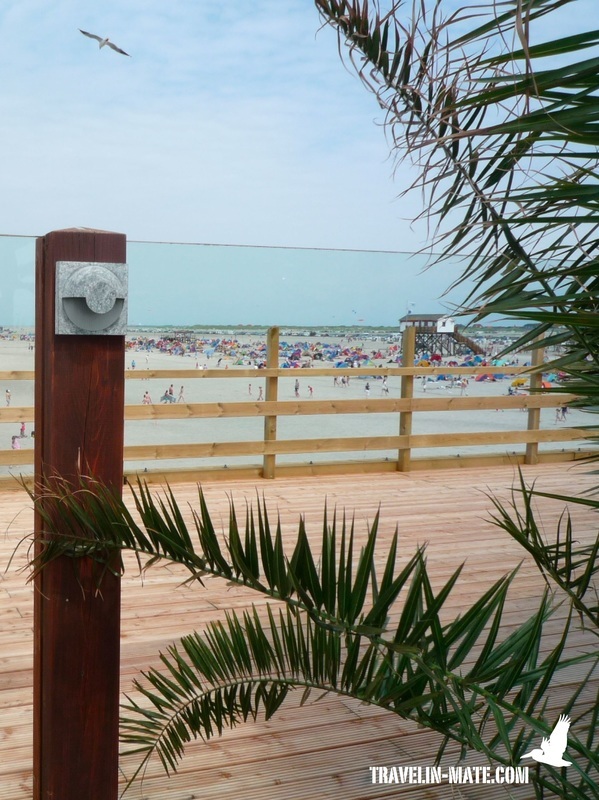 With their height of over 26 ft (8 meters) they became a safe haven during high tide where guests were able to change for the beach and enjoy some drinks and snacks. Most buildings are still the original construction but some had to be restored due to damages caused by high tides, storm floods, and even floating ice sheets. Most of them are used as restaurants, bars, or lifeguard stations. Similar to other German beach resorts, guests have to pay a daily visitor tax. Without the payment you are not allowed to enter the beach area. If you stay in a hotel the fee is either included in your rate or added separately and you receive a visitor’s card that you have to take with you to the beach. If you come for a day you have to pay at the small shacks at the beach entrance. For beautiful views over the sand dunes, salt meadows, and shore I recommend to bike along the high banks that protect the village from high tides or to walk over the scenic sea bridge in Bad to the ocean. As soon as you reach the beach take off your shoes. 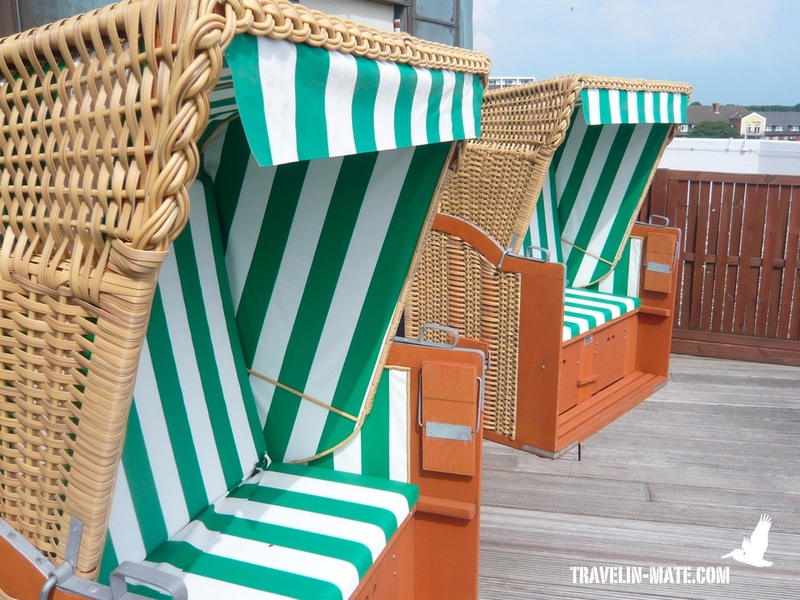 During low tide walk over the tidelands for a stroll (guided tours are available at Dorf beach) and/or take a sunbath at the shore in one of the cute roofed wicker beach chairs. The best way to end the day is to visit one of the restaurants in the beautiful stilt houses. From the top you can enjoy scenic sunsets (if the weather permits it) and indulge with outstanding Northern German fare. If you arrived early or stay longer than a day add a stroll through the picturesque Dorf district to your schedule. If your accommodation is located in Bad or other parts of St. Peter you can walk or bike to Dorf along the bank promenade. This lighthouse is the most famous landmark at Schleswig-Holstein’s west shore and located less than 9 miles North of St. Peter-Ording. The red and white striped tower that is framed by two twin cottages rises over 1360 ft (41 m) into the air and is visible from far away. 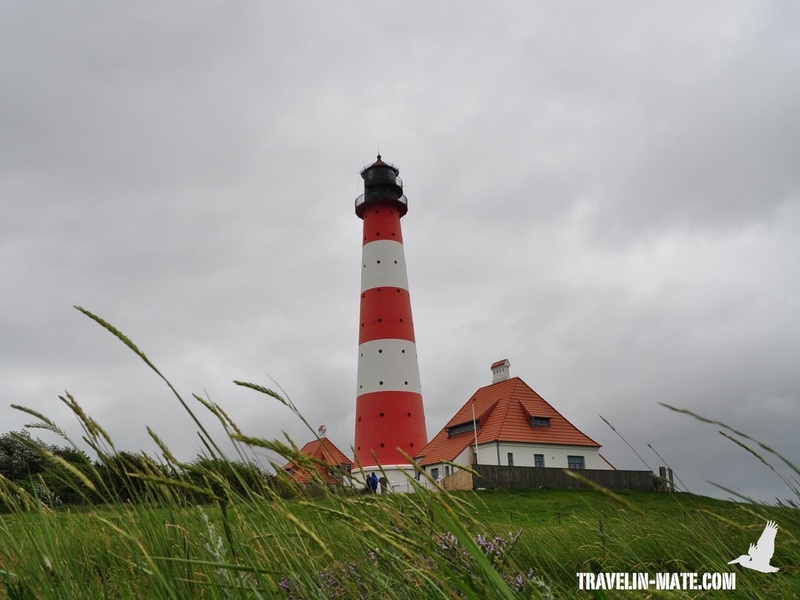 In 1906 it was built on a dwelling mound in front of the village of Westerhever. In the 1970s a Northern German brewery started using the site for its ads and commercial and eversince Westerheversand became a famous shooting location for commercials, music videos, ads, TV shows, and movies. You can access the property over a scenic paved walkway through meadows and over bridges that go over small creeks. A roundtrip from the parking lot takes about 1.5 hrs. To get there follow either B202 to the North by taking Eiderstedter Straße to the West and then Dreilanden to Tümlauer Chaussee or you take Neuweg to Tümlauer Chaussee. Continue on Tümlauer Chaussee that becomes Koogstraße and make a left onto Süderheverkoog-Chaussee. 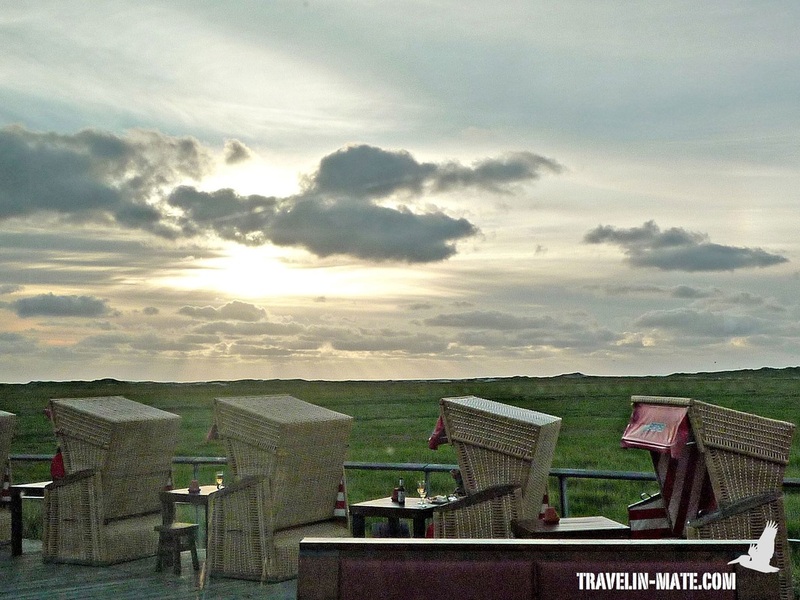 At Westerhever Straße you make a left and follow the road up to the parking lot. 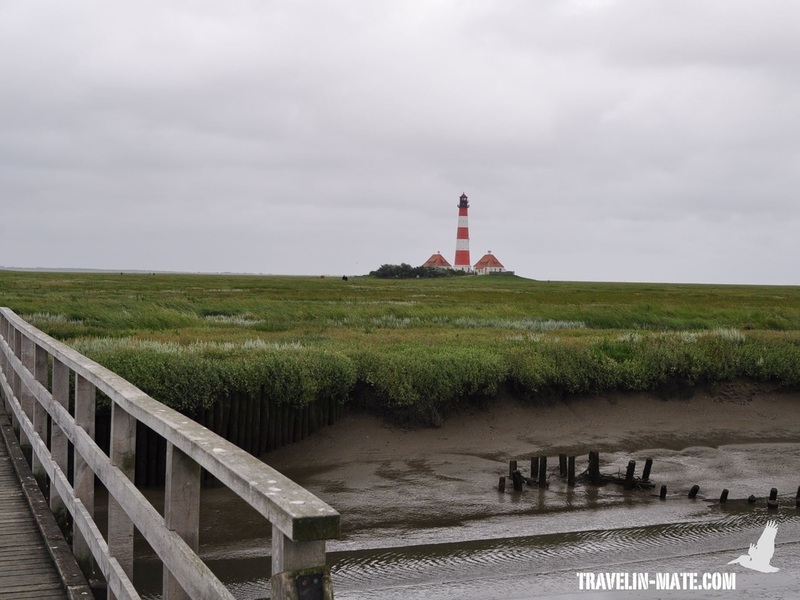 This small town with the nickname “little Amsterdam” is located 40 km (25 miles) Northeast of St. Peter-Ording and 35 km (22 miles) East of Westerheversand lighthouse. In 1621 Duke Friederick III who wanted to upvalue his territory with a logistic junction on the trade lane from Spain, Russia, and East India founded Friedrichstadt as a commercial center. To implement his plan the duke was in need of people who were able to build waterways. The reason he started to woo Dutch citizens into his new town by offering them the freedom of worship, Dutch as official language, and tax benefits in return. He gained these ideas from his uncle who earlier founded the city of Glückstadt as a trade hub along Elbe River with the same motifs. Similar to Glückstadt the town of Friederichstadt was planned on a drawing table. Due to the residents’ Dutch heritage almost all buildings contained typical Dutch elements and several canals running through the town. Most of the houses, bridges and some canals have been preserved until today and became the town’s landmarks. To explore the historic center, park your car or lock your bike in the area of market square. From the square you have nice views towards the town hall, the stepped gable houses (no. 16-24) that were built for merchants, the stone bridge, and the market pump. The pump was erected in 1879 and is covered by a gothic pavilion. Follow the stone bridge (Steinbrücke) to Mittelburgwall no. 24 where you come across the Neberhaus (Neber’s house). This house is a great example for Dutch interior design in the 17th century; so don’t hesitate to go inside. From there continue along “Lütje Brüch” to the Grafenhaus (Earl’s house), which has a beautiful facade. Straight ahead follows Lohgerberstraße that looks historic but was built in 1985 based on the town’s historic structures, which were destroyed in the wars of the 19th and 20th centuries. The next sight is the Remonstrant church, the only one outside the Netherlands. The church with its high tower is located in between Kirchenstraße and Prinzenstraße. If you walk towards Prinzeßstraße 26 on the opposite you will find Kettererhaus (Ketterer’s house), the home of the Swiss watchmaker. Through the windows you can see a room decorated with dolls dressed in costumes of the town’s diverse cultures and religions. Cut over to Prinzenstraße and to house number 28, the Paludanshaus (Paludan’s house), a beautiful former wine merchant’s home. Close by is the Doppelgiebelhaus (double gable house), another beautiful historic building. Continue your walk down to the corner of Prinzenstraße and Am Fürstenburgwall and turn right. At the corner of Fürstenwall and Binnenhafen you come along the area where the first building of Friedrichstadt was constructed. Walk up Binnenhafen to pass old storage houses and the Jewish synagogue (at the corner of Binnenhafen and Westermarktstraße). Back at Am Mittelburgwall you see the Mennonite church and the Lutheranian St. Christopherus church. I guess these few churches give you an idea about the great variety of denominations that resided and are still present in Friedrichstadt. More details about Friedrichstadt is available under: http://www.friedrichstadt.de (the English page is under construction).